Powerful cleaning cream, specially formulated for the removal of surface rust, oxidation, corrosion, and tea staining. It restores surfaces to their original gloss and protects them from new corrosion. 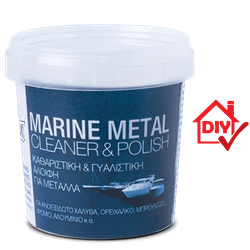 Suitable for cleaning, polishing, and restoring metals, such as stainless steel, brass, copper, nickel plated and non-anodized aluminum. It is ideal for stainless steel handrails of ships.